Iranian President Ahmadinejad Revealed To Be A Freemason! Another Reason That Iran Will NOT Be Invaded or Attacked! 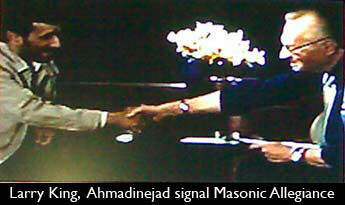 Title: Iranian President Ahmadinejad Revealed To Be A Freemason! Another Reason That Iran Will NOT Be Invaded or Attacked! 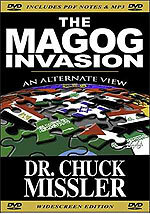 Subtitle: Proof positive that Illuminized Freemasonry controls both sides of any conflict. President Ahmadinejad is one of the Global Elite and, as such, his country will not be prevented from playing the role which Biblical prophecy has assigned it. Proof positive that the conflict between the West and Iran is staged according to the principles of the Hegelian Dialectic! Copyright © 2008 Cutting Edge Ministries. All rights reserved. See full copyright notice below. Iranian President Ahmadinejad is a Freemason! As you can see from the above picture, the Iranian President is exchanging a Masonic handshake with Larry King! There is no doubt whatsoever that King is giving the Iranian President a traditional Masonic handshake. Let us go to the article from which this picture is taken. This information is absolutely correct! When Larry King gave Iranian President Ahmadinejad the Masonic handshake, he was signaling to all the occult world that the Persian leader is a member of the Masonic secret society. 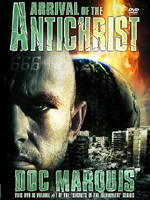 Therefore, all occultists throughout the world will know that the Iranian President is being controlled by the Illuminati and is simply carrying out his assigned script. Therefore, we must realize that this handshake is also confirmation that the entire Iranian crisis over their supposed nuclear warhead development program is a scripted crisis in which the leadership of Russia, Iran, Israel, the United States, Great Britain, and the European Union all have a role to play. In other words, the deliberately created crisis with Iran is following a script that will result in massive amounts of "Rumors of War" without actually descending into war. This reality is the reason that President Bush and his officials have breathed fiery threats time after time after time for five long years without any resulting military action. This fact is the reason why massive American naval and air forces have built up in the waters and in the air near Iran since Summer, 2003, only to quietly disband every single time. What are the purposes of the secret Masonic handshake? We need to go back to the book by John J. Robinson, "Born In Blood", to pick up this historical story. However, the historic roots of this practice of handshakes can be traced all the way back to Biblical times, when the Babylonian secret societies dominated the occult world. Listen to the Biblical admonition against secret handshakes. Proverbs 22:26 -- "Be not one of those who strike hands and pledge themselves ..." Once again, we discover that, if a person is thoroughly familiar with the commandments of the Bible, he would never be taken in by the lying nature of Freemasonry. 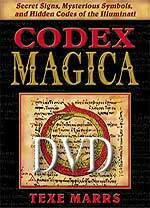 As soon as they discovered the bloody oaths they were required to take, and the secret handshakes they were required to learn and practice, and the very fact that Masonry has deep, deep, dark secrets they are most afraid to make public, the Christian would immediately walk out of the Lodge, never returning. Further, he would shout the warning to the rooftops that Freemasonry is not, will not ever be, nor ever was, Christian. At the very end, Marrs reports that Masonic handshakes are demonic. Now, let us examine some other modern examples of Masonic handshakes. The picture on the left depicts the Masonic handshake perfectly. Note the position of the thumb over the finger of the hand on the left in this picture; it is distinctly cocked and uniquely positioned over the knuckle of the first finger. This is the perfect Masonic handshake. 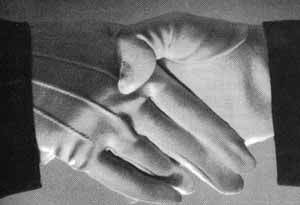 In reality, the accuracy of the handshake depends upon the skill of the person giving, or receiving, the handshake. Some Masons do a good job and some Masons do a lousy job. 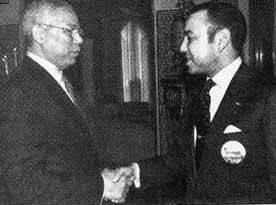 The picture on the right shows Secretary of State Colin Powell exchanging a Mason handshake with Morocco's King. The King is giving General Powell a very good handshake, as his thumb is clamped on Powell's first knuckle at just the correct angle. There can be no doubt about the fact that Iran's President is a Mason and that Larry King wanted to flash that fact to all discerning members of the Fraternity worldwide. You can thus add one more reason to the long list Cutting Edge has provided as to why a Western attack on Iran will never happen! This scenario, carried out on a massive global scale, is nothing more than a fulfillment of the "Rumors of Wars"! Truly, the daily events of the day demonstrate the fact that the peoples of the world are steadily moving towards the final wars which shall place Antichrist on the world scene. Are you spiritually ready? Is your family? Are you adequately protecting your loved ones? This is the reason for this ministry, to enable you to first understand the peril facing you, and then help you develop strategies to warn and protect your loved ones. Once you have been thoroughly trained, you can also use your knowledge as a means to open the door of discussion with an unsaved person. I have been able to use it many times, and have seen people come to Jesus Christ as a result. These perilous times are also a time when we can reach many souls for Jesus Christ, making an eternal difference. Copyright © 2008 Cutting Edge Ministries. All rights reserved. This password protected article and its contents are protected under the copyright laws of the United States and other countries. This article is provided by subscription only for use by the subscriber and all other rights are expressly reserved by the copyright owner. Copying and pasting this article, in whole or in part, into e-mails or as attachments to e-mails or posting it on the Internet is strictly prohibited and may subject the offender to civil liability and severe criminal penalties (Title 17, United States Code, section 501 and 506).